Serving some of the best and most affordable sushi in town since 1972! The antithesis of many of the city’s noisy, crowded Japanese establishments, this unpretentious eatery in Little Tokyo serves up some of the best and most affordable sushi in town. Oomasa opened in 1972 before the sushi craze of the 1980s, and has developed a loyal following of locals, as well as fans that drive in. Behind the impressive sushi bar, chefs create a tempting selection of sushi, sashimi and rolls. 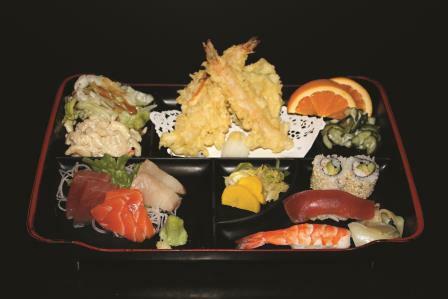 For lunch, try the numbered specials — compartmentalized trays with fish, tempura, meat and salads. It’s an enormous amount of food for around a steal. But the menu doesn’t stop at sushi. There are udon noodles with a poached egg dropped in a giant bowl, or favorites like the golden and tender pork cutlet, flavorful chicken or beef teriyaki, and crispy tempura combination plate. Oomasa has earned a reputation for quality ingredients and top-notch service. It’s a tasty tradition that diners can’t seem to get enough of. Oomasa is located on 100 Japanese Village Plaza; just a few blocks away from the Metro Gold Line (Little Tokyo/Arts District Station). For your best route, use the Trip Planner.